Extensis on Wednesday announced the release of Universal Type Server 2.0, its font management system for Mac OS X and Windows workgroups. It’s priced starting at $1395. 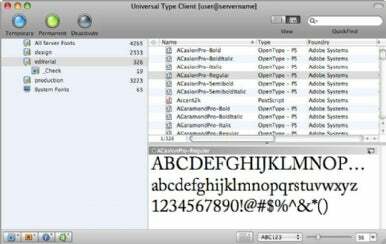 Universal Type Server lets clients preview fonts before they install them. Universal Type Server helps creative businesses and workgroups handle font-related workflow issues and problems. It lets companies centralize font libraries, users and permissions, helps to eliminate font conflicts, supports font previews and auto-activation, checks fonts for integrity and corruption before distribution, and works with Adobe and Quark applications. New to the 2.0 release is support for Active Directory and Open Directory, an External Database Module that supports Microsoft SQL Server, report generation on font license compliance; support for “system font policy,” font previews with “tear off” functionality, and auto-activation plug-ins for Adobe Illustrator and InDesign CS2, CS3 and CS4, as well as QuarkXPress 7 and 8. Other new features have also been included. Universal Type Server comes in two versions: A $1395 “Lite” edition that is suitable for workgroups of 10 users or fewer (it includes the server software and a 10-user license), and an $1800 “Professional” version suitable for larger workgroups (it costs $165 per client connection, as well). Server system requirements call for Mac OS X 10.4.11 or later, G5 or Intel-based Mac, 1GB RAM, 250MB hard disk space plus spae for fonts, Safari 2.0 or Firefox 2.0 or later and Adobe Flash Player 10 or later.